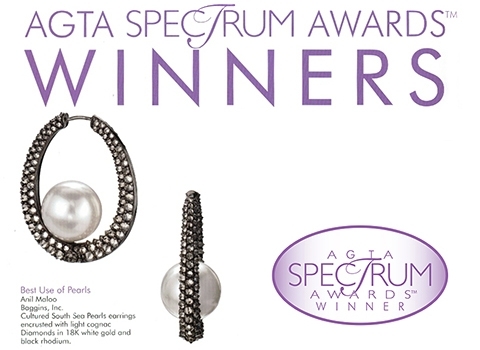 Baggins, Inc - AGTA Spectrum Award Winners - Three Years in a Row "Best Use of Pearls" and 1st Place "Bridal Wear" for 2014!!! - Anil Maloo, Baggins, Inc. - 18K white gold drop earrings featuring 32 Japanese Akoya cultured Pearls accented with round brilliant Diamonds (4.43 ctw.). 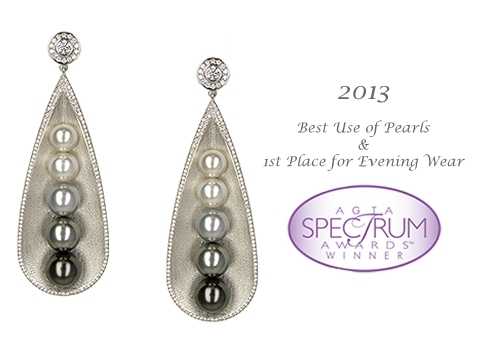 As the beginning of 2013, we are proud to announce that for the second year in a row Baggins has won the AGTA Spectrum Award for Best Use of Pearls! We had the additional honor of taking First Place in Evening Wear! 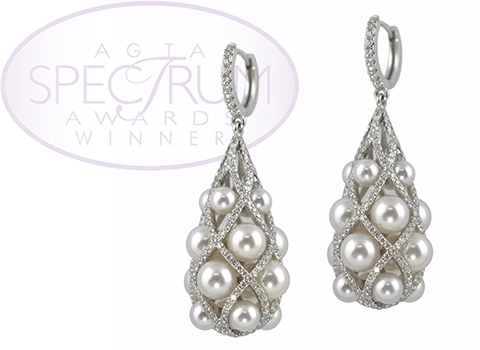 Please come and see our award winning earrings at our booth in Luxury & JCK Las Vegas show. 14K white gold earrings, Akoya, South Sea, and Tahitian Pearls color & size graduated and accented with Diamonds 2.42ctw. 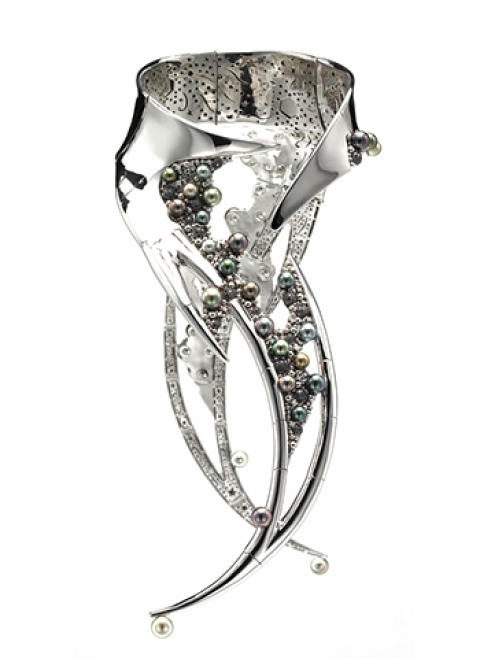 Dallas, TX - October 25, 2011: Winners have been named in the 2012 AGTA Spectrum Awards™ competition hosted by the American Gem Trade Association. This year marks the 28th anniversary of the competition. The competition was judged October 22-23 in New York, NY. Judges for the 2012 competition were Master Goldsmith Klaus Burgel, Sylvain Chervin of Carvin French, Cindy Edelstein of the Jewelers Resource Bureau, Patricia Faber of Aaron Faber Gallery, and Clay Zava of Zava Master Cuts. The annual AGTA Spectrum Awards™ Media Day was held October 24 and featured all of the jewelry and gemstone submissions. Attendees included top fashion/accessory editors from the trade and consumer press, stylists, and bloggers. Publications represented included Vogue, W, Elle, Harper’s Bazaar, InStyle, Women’s Wear Daily, Marie Claire, Essence, Smart Money, and many more. By Anil Maloo, Baggins, Inc.
18K white gold and black rhodium plated earrings encrusted with light cognac Diamonds (8.16 ctw.) and 13.3mm cultured South Sea Pearls. Baggins' "Aurora Eclipse" earrings design, winner of The Orient Award. The Orient Award is the award given to the entry that would inspire a new found affinity in someone for cultured pearls. The earrings are crafted in 18KT white gold with a black rhodium finish, encrusted with 8.16ct of light cognac diamonds which are Pave' set upside down. 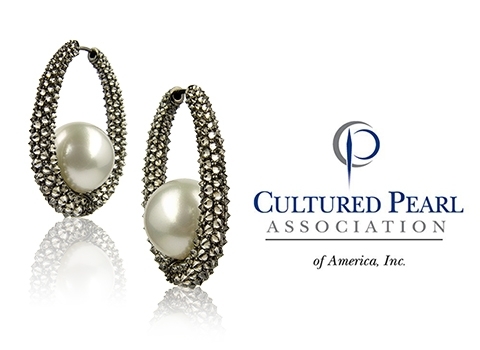 The cultured peals of this exquisite pair of earrings are round, 13.3mm White South Sea Pearls. The "Ethereal Rhapsody" necklace by Reena Ahluwalia & Baggins, won the Perles De Tahiti's Tahitian Pearl Trophy for North America. 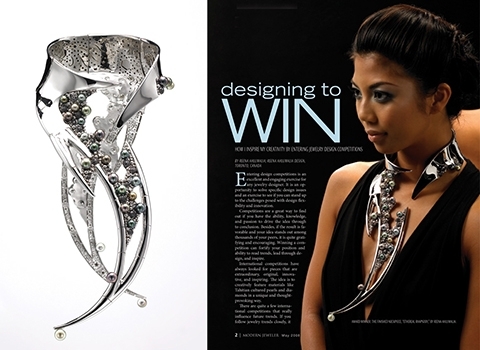 One of the most reknown design competitions for pearl jewelry is Perles de Tahiti's Tahitian Pearl Trophy. This prestigious international affair takes place every two years and is an unequalled international artistic competition. The Tahitian Pearl Trophy competition is the initiative of GIE Perles De Tahiti, the official promotion body for Cultured Pearls in French Polynesia. The neckpiece uses sophisticated internal spring-loaded mechanisms, which open and close this piece comfortably. The necklace is hinged for flexibility and follows the body contours elegantly. It features 45 lustrous multi-coloured pearls (12.0-8.5mm), 9.24 cts. of pavé set black diamonds and 3.70 cts. of prong set white diamonds set in 886.50 grams of 18 K mirror finish white gold.